How many volunteers are too many volunteers? Time banking – volunteering or profiteering? June 16, 2015, No Comments on Need a volunteer database? 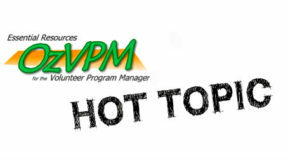 November 17, 2015, 6 Comments on Ten questions every VM should ask a potential employer! Are you a good volunteering parent? September 19, 2015, No Comments on Are you a good volunteering parent? April 25, 2015, 3 Comments on The ANZAC’S – Our Greatest Ever Volunteers? April 15, 2015, 2 Comments on Is it time to re-define volunteering?